Home  My Gleanings Page  Illustrated Issue - Page 1. Illustrated Issue - Page 1. The Counties of Crittenden, Livingston and Caldwell a Mass of Lead, Zinc and Fluor Spar. Shipments Aggregating Millions of Pounds Monthly of Zinc Ores and Fluor Spar. THE GREATEST KNOWN TRUE FISSURE VEINS. BARITES, OCHRES, UMBERS, KAOLIN, GLASS SAND, FIRE CLAYS IN MASSIVE DEPOSITS. THE MINING, AGRICULTURAL, FRUIT RAISING, FINANCIAL, PROFESSIONAL AND RELIGIOUS OUTLOOK. MINING ZINC CARBONATE FROM OPEN CUTS. 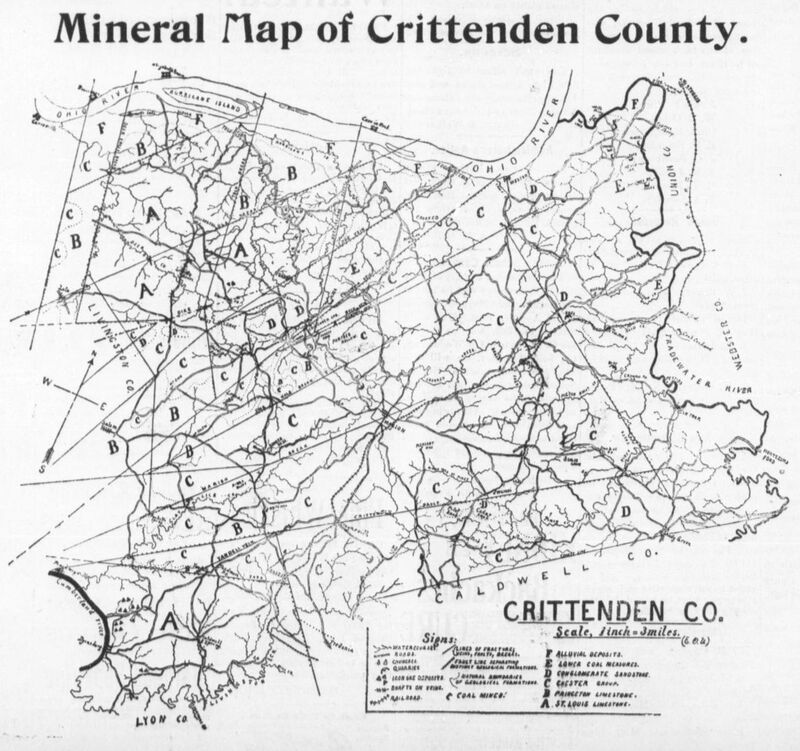 The Western Kentucky Mining District, comprising the counties of Crittenden, Livingston and Caldwell, is, in every respect, unique in its mineral wealth. Its massive veins of fluor spar are drawn upon by the consumers of this remarkable mineral in every portion of the country. It has the greatest Carbonate of Zinc properties in point of size and grade of product known in the world. Its greatest fissure veins of galena and zinc blende are, so far as human knowledge goes, of unlimited depth and of great richness. Its immense veins of pure white Barytes outcrop on the surface thirty feet wide. Its Kaolin, or China Clay, is in deposits, forty feet thick, pearl white, and practically, ready for the manufacturer of the finest ceramics. Its pigments, the Ochres, Umbers, Metallic Browns, Sienna, etc., make the finest and most durable paint known. Its glass sand is pure white, 100 per cent. silica, and can be mined with a steam shovel. Its Calc spar produces the finest lime known to chemistry. Its hydraulic limestone would supply the earth with cement. Its Feldspar, Fire Clay, Ship Clay, Ball Clay, Quartz, Flint Pebbles, are all marketable minerals, and command good prices. It is a magnificent showing, and thousands of acres of its lands can be leased on royalty or purchased at farm prices. Its the mineral heart of the continent. On its farming lands are raised the finest horses, mules, cattle and hogs of any section in the united States. The best longberry wheat, white flint corn, sweet potatoes, Irish potatoes, white oats, and rye are produced. Tobacco by the million pounds. Great coal banks in Crittenden county. The Illinois Central Railroad on one side, the navigable waters of the Ohio, the Cumberland, the Tennessee and the Tradewater bound the others. What more could one desire. Its churches are filled every Sunday, and, there are dozens of them. The best schools in the land are right here. Men and women are young at eighty-five. The St. Louis limestone is the oldest formation at the surface. It outcrops at Dycusburg and at Tolu. It is compact, silicious [siliceous] and of varying shades of blue. The beds at Dycusburg are fine grained magnesian limestone and would make good hydraulic cement. The St. Louis limestone is marked "A" on the map. There is another series of limestone to which I have applied the name of the Princeton group. They have a thickness of about 200 feet and the spaces where they are at the surface are marked "B" on the map. The formation next above the Princeton is known to the geologists at the Chester group and consists mainly of sandstone, the thickness of the strata is not less than 400 feet, and is marked "C" on the map. The conglomerate sandstone which is the lowest formation of the coal measures rests on the Chester. This sandstone is course and generally contains small pebbles of white quartz. The region where it prevails marked "D" is almost invariably on high ground. this high ground is eminently fitted for fruit culture. In the region marked "E" the lower coal measures are at the surface. These are of importance because of the excellent beds of coal they contain. The spaces marked "F" represent bottom lands. these occur mainly along the Ohio river from Fords Ferry west. Considerable tracts of such bottom lands also occur in the valley of the Tradewater. The coal seam is one of the lowest in the series of true coal. It outcrops at a number of points along Tradewater from the mouth of that stream to Blackford where the line outcrop crosses over into Webster county. The average thickness of the seam is four feet, and consists of a very black and a very soft bituminous coal closely resembling the best Pittsburg varieties. They are clearly better than any other coals used in Western Kentucky, and compare very favorably with Youghieny coal. Large beds of umber and yellow ochre of very fine quality occurs about five miles from Marion. Other cheap pigments could be manufactured from the soft Chester shales which are exposed at several points. Iron ores of several varieties occur at many points. These ores are limonite brown ores and are precisely like those of Western Tennessee and of the region known as between the rivers in Kentucky. As usual these ores occur in "pockets," a few appearing practically inexhaustible, while many may not contain over a thousand tons of ore. It may be stated without fear of contradiction that this district contains more deposits of lead, zinc, fluor spar, and barite than any other section of the State. The zinc and lead deposits invariably occur in the line of the fractures. They are, therefore, in the true fissure veins, the origin of which was in no way dependent upon shrinkage of the strata nor to the eroding or cavity making effects upon the limestone. On the contrary these fissures are of deep seated origin, having resulted from convulsive movements of the earth's crust whereby it was produced and the country rock for some distance on one side of the dislocation either shoved up or thrown down. Among the twenty or more "faults" that I have determined the down throw was not less than 200 feet and in most cases 1000 feet. The limestones that has been counted as the principal source of the metals in this region are the Princeton and St. Louis having an aggregate thickness of no less than 500 feet. These veins should be productive to a depth of 800 to 900 feet. In searching for mineral deposits the prospector will do well to follow the line of fracture as laid down on the map. Success is more likely to reward his efforts along these lines than elsewhere. Valuable deposits may be discovered at almost any point on them but experience teaches that the chances for finding them at the surface are far the best where limestone occurs on one or both sides of the fault. Massive snow white Barite occurs in twenty foot veins and can be mined very cheaply as it lies on a railroad. I believe that I have mentioned enough to prove that this district is unusually rich in mineral deposits. Among the first steps to be recommended are greatly increased facilities for transportation, not only in the railways but county roads. For obvious reasons this point can not be too strongly urged. The development of the mineral deposits should be along two natural lines. In the first a revival of the coal industries go hand in hand. these alone would be of great consequence in the progress of the county. In the second line the development of the lead and zinc, barite, and fluor spar deposits; ochres, and other cheap pigment, are associated. A large plant might be established at some point along the river, say Tolu, for instance, where the various products might be worked up. All sorts of paints could be manufactured there. Having the crude material and the sort of transportation close at hand, this enterprise, if properly conducted, could scarcely fail to be remunerative. And why would it not be wise to establish a pottery in the same locality? With the fine clays and as good spar as can be found anywhere, pottery ware might be manufactured under more advantageous circumstances than at any point where the industry is carried on. Four Known Veins of Galena Prospected for Miles. What is known as our four lead veins, the Columbia, the LaRue, the Tabb and the Eureka, traverse the entire district. Of course, like all mineral veins, there are places in these veins that are poverty stricken; other points where the lead or galena fills the entire fissure. Such rich spots are at the Columbia shaft, the Cullen shaft, the Tabb and the opening on the LaRue at Deer creek and what are known as the Franks mine and the Morning Star mine masses of galena have been mined that weighed 800, 1,000 and the largest 1,400 pounds. Great quantities of galena are found in kidney form and among fluor spar. This is notably the case in the Cullen, the Yandell, the Hodge, the Columbia, the Franks, the Morning Star and the Tabb mines. The smelted lead is exceptionally soft and is much sought after by white lead manufacturers who pay a premium for it above the market price. It is a rare thing elsewhere to find galena in a matrix or gangue that is marketable at good profitable prices. No such conditions exist anywhere else in the world. The fluor spar is the gangue completely filling the vein with the addition of great kidneys of galena. The separation is mechanically easy, the fluor spar going to the iron furnaces and the galena to the lead smelters. The profit is as a matter of fact, large. Twenty percent galena, eighty per cent fluor spar; miners can't help becoming wealthy. No barren material in the veins, all merchantable product, a marvellous [marvelous] fact in our lead veins. Remarkable Veins of Carbonate and Blende. Zinc Blende, the ore that made Joplin a wonderful city is a persistent mineral. It squeezes itself in and among many of our veins and at times is an unwelcome visitor. Notably so when it is found in our fluor spar, the specific gravity of both minerals being practically alike. Its separation from fluor spar being mechanically impossible, the mixture is sold as a flux. At depth the fluor spar drops out and leaves "Jack" in entire possession of the vein. Then comes the triumph of the Joplin type of mill and Zinc Blend[e] is produced at a rapid rate. Much of the vein matter is solid "Jack" and requires no dressing. It is worth double the price of carbonate. It will be mined in our hundreds of shafts after we are all dead. A thousand feet deep in our fissure veins and "Jack" will still meet us. The only way to get rid of him is to mine and ship. This we are beginning to do. The Columbia, the Cullen, the Holly, are types of our best Blende openings. At the bottom of the Holly shaft, 70 feet in depth, the fluor spar disappears and nothing but calcite and zinc blende is visible. At 140 feet in the Columbia, galena, blende and calcite fill the great vein. At the "Old Jim" just under the carbonate, great masses of pure Jack entirely free from gangue are raised. At the 100-foot level of the Tabb, blende, galena with baryte only, prevail. At the Cullen mine galena, blende and fluor spar continue; at greater depth the fluor spar will disappear. Blende will be the prevailing, the lasting ore all over the district. We will raise the blende in this district for the metallic zinc to roof the skyscrapers of the 30th century. Sometimes Called Heavy Spar, Pure and White. Barite or Barytes is a very heavy white mineral used largely in the adulteration of white lead. It is scarcely ever found without its being somewhat stained or discolored from its connection with earthy or iron substances. The mineral is carefully assorted, crushed and treated to a sulphuric acid bath to remove these stains. It is then ground to an impalpable powder floated on water or in air, the residue being reground and again floated. The fine material is packed in barrels and sells at about $16.00 per ton in Chicago. The crude barites, when fairly free from iron stains, is worth about $[? ].00 per ton at St. Louis. That city is the great barites market of the country. It handles the great deposits of Missouri. Our district has several notable deposits of sparkling whiteness and superior to most other sections. The Page & Krausse Co., of St. Louis, say that our product is a trifle harder than the Missouri output. It ought on that account to go into fluor much easier. It is beautiful in its pearly whiteness. Somebody will open these veins and find a gold mine in value. It will require a good capital to put up the necessary machinery but it will pay from the grass roots. Possible a great vein of galena is under it; it often happens that way. A vein of of [sic] galena, so much the better, it would then be two gold mines in value. The land is open for men who know how to do things. Unusual Advantages Offered to Manufacturers. Ochre and seinna[sienna]-earth, native earths tinted with iron, are in abundance. Calcining these earths expels the water and changes them into red oxide. The nature of the associated earths also influence the color assumed by an ochre; with aluminum compounds it develops red or violet tints, while the calcareous varieties take brownish red and dark brown hues. The principal mineral reds owe their color to oxides of iron which is in great quantity throughout the Western and southern portion of the district. These reds are closely allied to the yellow ochres. Tints passing from orange to deep purple reds are obtained by the calcining of the yellow ferro oxide, or rather the yellow ochre so prevalent with us. Rouge, or Mars Red, Crocus, Indian Red and Turkey Red are all pure ferric oxide varying in depth of tint from the burning or calcination in different degrees of heat. The other iron reds are all of the nature of ochres. Iron and manganese, two minerals found in abundance here, are the sources of the principal brown pigments[.] Some of these browns are intermediate products between yellow and red ochre; these colors may be heightened or otherwise by burning. Vandyke Brown is a pure iron oxide and iron earths of a clear brown hue. Many shades of yellows, reds and browns can be prepared from these earths by mixing and by different degrees of heat used in burning or calcination. The district offers unusual advantages for the manufacture of these colors, low priced coal, cheap lands and an abundance of raw material. The large deposit of Kaolin or China Clay near the Ohio river at Tolu, sixteen miles from Marion is perhaps one of the best examples of our porcelain clay. Absolutely free from grit, of a beautiful, clean color and in vast quantity, its nearness to river transportation makes it extremely desirable for the establishment of a pottery plant. With fluor spar in its immediate vicinity and glass sand in large quantities a few miles distant, a glass works could also be established with profitable results. Source: Crittenden Press. (Marion, Ky.) 1879-1907, July 10, 1902, Image 2 - Chronicling America - The Library of Congress.